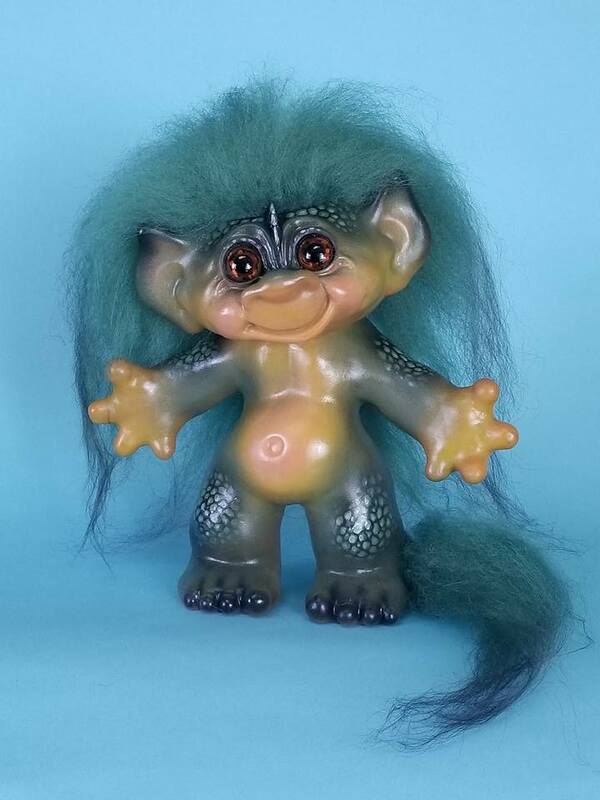 An array of Judi Paul’s new line of troll dolls, custom-painted and redesigned. A pretty hairy premise! Paul adds whimsy to yetis, abominable snowmen, and multiple Big Foot characters! 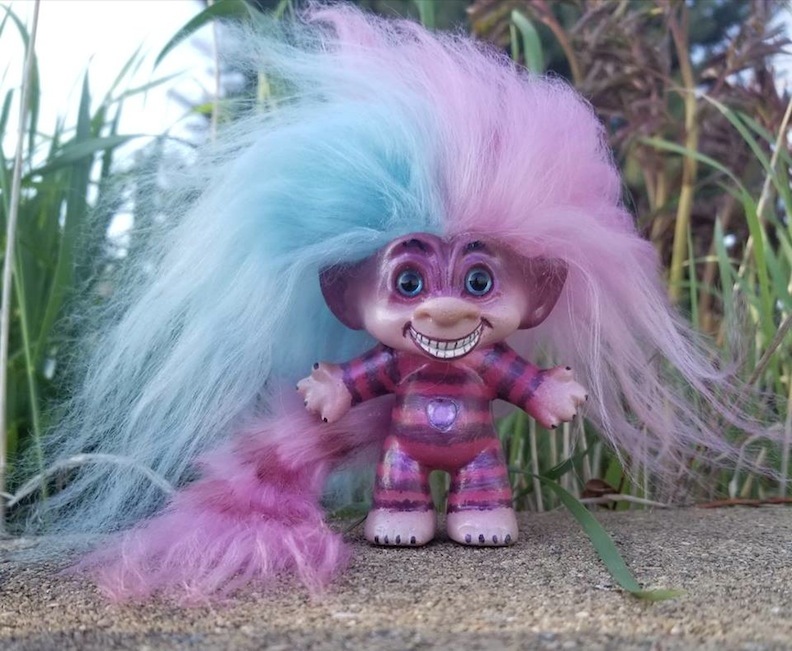 Judi Paul salutes her Alice in Wonderland affinity with this Cheshire Cat troll doll. Since that decision, Paul has been on a troll-roll. 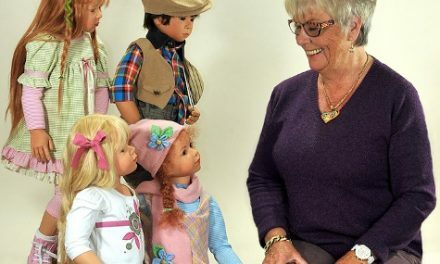 She has been obsessed with giving her troll dolls total makeovers, converting them into mermaids, unicorns, dragons, Yetis, and all kinds of forest wildlife. 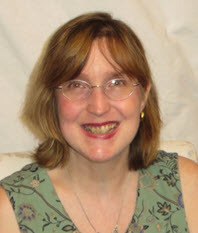 The conversion is a serious undertaking, and when she changes a troll into something new, it involves removing the troll’s clothing, getting rid of its existing hair and eyes. Then she begins the prepping and the painting. 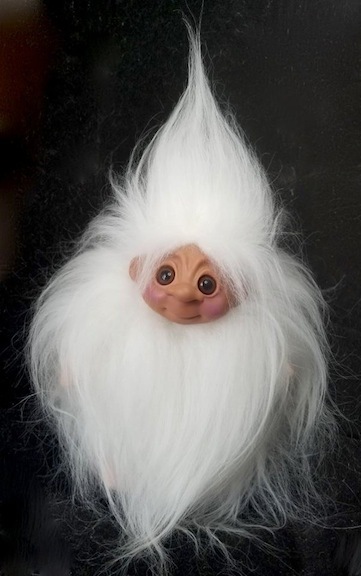 “No matter what makeover, I always keep the troll look and I replace the hair to traditional-troll Icelandic sheep-wool hair. On most, I hand-paint glass eyes with details, and I recently created follow-me eyes, an illusion of the pupils looking at you no matter what angle you hold the troll,” she explained. The Danish artist had been a fisherman, bricklayer, and a baker before he carved his first troll sculpture, made in his own image. 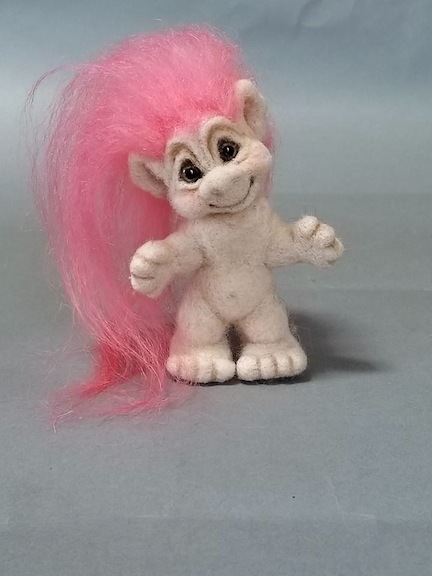 Creating trolls to be sold at fairs, Dam eventually could not keep up with the demand. As a result, Dam and his family had to finance and build a factory. 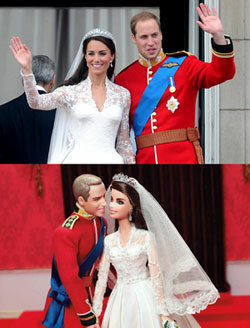 The 1960s saw an explosion of these goofy and gangly characters, and the demand intensified. Dam and his employees had to invent a new kind of plastic that could be utilized while making the troll’s body on a machine. This innovation was guaranteed to last longer than natural rubber. Beyond the molding of its body, the rest of the Dam trolls anatomy was mainly handmade. Commemorating her immersion into this brand-new, fantastical world, Paul decided to create a tribute to the man who set the whole phenomenon into motion. 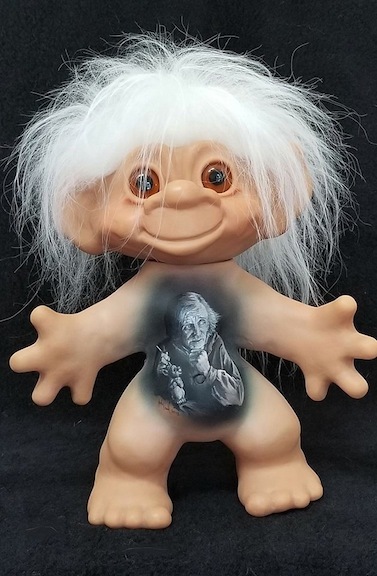 She airbrushed and hand-painted a portrait of Thomas Dam on the front of a 12-inch Dam troll doll. “The Thomas Dam portrait troll is actually on its way to Denmark to be displayed in an upcoming troll museum, I am so very honored!” Paul shared. At present, her business website is being revised and renamed. When it is operational, it will be called LuxembearsStudios.com. 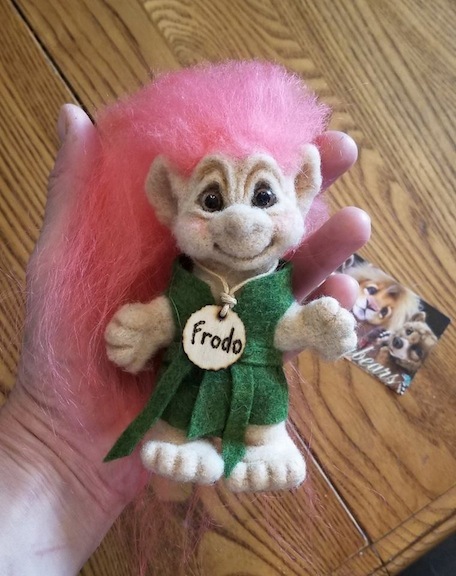 Recently, she created a new artist page called “Troll Arts by J Luxembears,” but she plans on having a section for troll art when her new website is up and running. 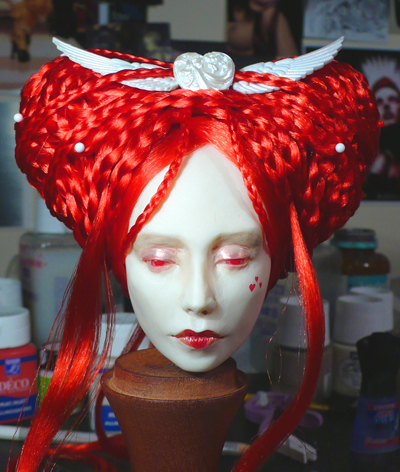 Judi Paul will be creating troll dolls as crocheted characters, needle-felted marvels, and as brand-new silicone molds. “I have ideas flooding into my head, and I can’t work fast enough! 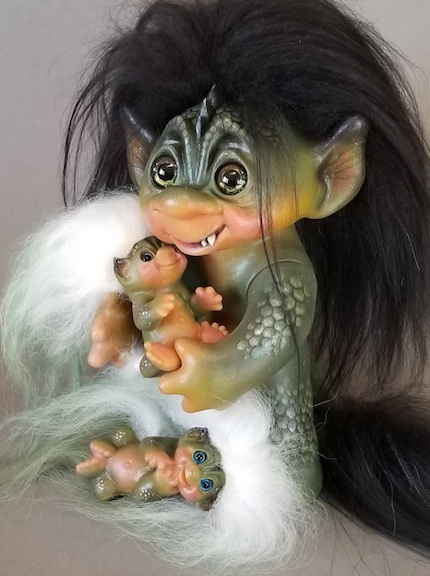 Besides the transformations, I want to do mohair soft-sculpted troll dolls, crocheted and knitted troll dolls, sculpted jewelry, airbrushed wearable art, illustrations and paintings. There is just so much to do!” she recounted. 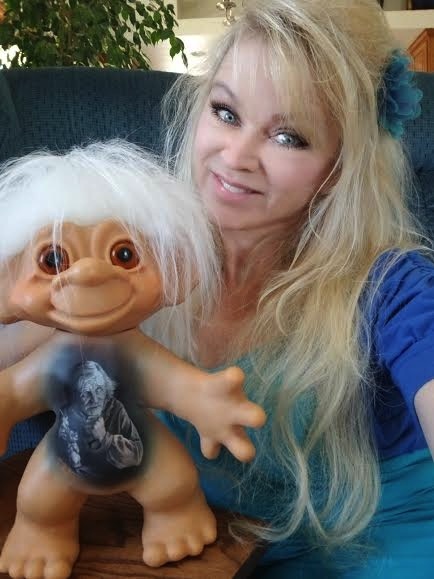 “Also, I plan on sculpting my own troll doll design to cast a mold so I can make multiple silicone troll dolls.” Judi Paul’s future will certainly be filled with good luck, giggles, and a growing love for these offbeat, oddball characters.